Info: BATTLECRY is an online multiplayer action game from Bethesda Softworks. The game amplifies team-based combat by combining visceral brutality and competitive multiplayer action to create a new gameplay experience. Choose your warrior – each with a meaningfully distinct suite of attacks and abilities – from one of several factions from diverse parts of the world. With strategy, brutal attacks, and unique weapons, fight for power and glory in 32-player battles across the WarZones. Take on the role of an elite warrior and engage in brutal, high-action, 32-player battles in a variety of gameplay modes. Responsive, smooth controls unleash violent, high-impact, and stunning combo attacks previously reserved for modern brawlers. Dynamic movement allows you to seamlessly grapple, evade and mantle to quickly cover distances and evade the other team. Engage in combat and use the game’s Adrenaline system to unlock special powers for a short time or conserve Adrenaline to unleash your lethal Ultimate ability when the time is right. 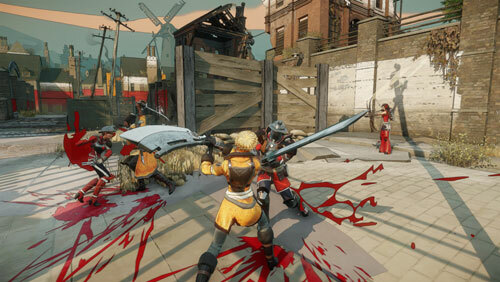 In BATTLECRY, your skill, timing, and teamwork create a diverse gameplay experience. Choose your side from the powerful Royal Marines, the courageous Cossacks and more as they come online, then build and progress your chosen warrior by earning iron and advancing through the ranks. Each rank unlocks new abilities and effects, allowing deep strategic builds for your Warrior on every Level. Select from classes like: the Enforcer, who wields a massive sword and transformative shield to inflict and absorb damage; the Tech Archer who unleashes a maelstrom of arrows from afar; or the Duelist, using blinding speed and stealth abilities to pick off unsuspecting enemies in isolation. Welcome to a world of ritualized combat where open wars are a thing of the past and warriors, the chosen few, risk life and limb in imaginative WarZones to maintain peace. Each Zone is designed to combine positioning, spacing and verticality to redefine your core combat experience. Fight with transformative weapons that harness iron and energy and eviscerate your opponents with swords that transform into shields, bows that can punch an arrow straight through an armored skull, or electrocute your foes with high powered blades crackling with electro-static energy. Enjoy intense graphics and animations, with immersive third-person cameras as you fight toward life or death. The game’s bold, expressive art style directed by Viktor Antonov (Half-Life 2, Dishonored) supplements the game’s visceral combat and heightens the gameplay experience. Inspired by comic books and illustrations, BATTLECRY’s highly-stylized environments change depending on whether you are winning or losing in the arena.